I’m fascinated by hard drives. I have been ever since the mid ’80s, when my brother-in-law, Lane, and I both had Apple IIe computers with 128K floppy disks, and he blew me away by getting a 5 megabyte hard drive to store data for his farm bookkeeping program. The cost: $1,800. And it seemed unfathomable he would ever fill it. Moore’s Law (from a paper Intel co-founder Gordon Moore published in 1965) suggests that computing power (or data storage) that can be purchased for a given price doubles every 18 months. In this post, based on my recently acquired custom of Black Friday hard drive shopping, I want to prove Moore’s Law for you. I usually get up early on the Friday after Thanksgiving to take advantage of the electronics sales, and one place I typically go is Staples. Two years ago, I bought a 500 gigabyte hard drive there for about $70 (after rebate.) That was 100,o00 times the storage Lane bought in 1986 for about $3,700 in inflation-adjusted dollars. Last year, I bought a 600 gigabyte drive, again for about $70. 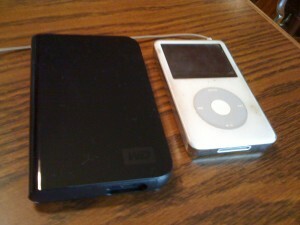 Especially with my use of the Flip video camera, my “need” for storage has increased. 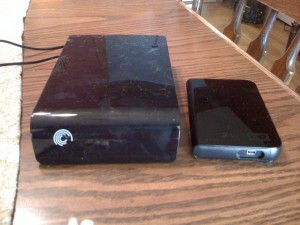 This year, I bought a terabyte drive (1,000 gigabytes) for $70. So in essence I got 200,000 times the storage Lane bought 23 years ago, for less than 2 percent of the price. Granted, this was a door-buster sale. But even at full price for one of these drives, it’s mind-boggling. And actually, I didn’t just get one drive; I bought two. In addition to the terabyte drive, I got another 500 GB drive that is powered by the USB connection. That makes it extremely lightweight, so I can carry it with me at all times in my laptop bag. As you can see in the photo below, it’s not much bigger than a classic iPod. Mark your calendar now for 11/26/2010 at 6 a.m. If Moore’s Law holds (as it has for 44 years), you should be able to get a 1.5 terabyte hard drive at Staples for about $70. With HD video consuming about 4 GB per hour, you can never have too much hard drive space.